When he had his first HT with us, he was a NW 5 progressing to a NW 6. The scalp donor area has lesser density. Intends to keep his hair short. At present he keeps a buzz cut. May want to keep the hair till 1 inch length. Desires to use body hair to acheive a low flat hairline as well as for filling the crown. The details of his surgery and intra operative pictures can be viewed at the following thread. The details of Magneto’s 2.5 week update is available atthe following link. No way ! what kind of hair style is that? Apart from 869 FUSE grafts that were extracted from the scalp, the remainder were extracted from body donor areas (Beard hair were not used - magneto’s choice), including, fingers, forearms, thigh, chest, abdomen etc. Following are some pictures taken by magneto recently. All I can say is that I very much appreciate the open and honest photos. » All I can say is that I very much appreciate the open and honest photos. Same here and on top of that there is no hard selling from the clinic which I also appreciate very much, they post their pics and then leave us alone to make our own conclusions. I appreciate the honest pictures as well. However, from what I gather this entire procedure was Body Hair, or close to it. I think the results for just BHT alone seem to be very good. I wish he would have mixed in more scalp hair, perhaps he would have even more density. Wow - amazing how opinions can differ !?!?!? In reality I think going back to the ‘stubble’ look is in my opinion the only way to wear this hair when it is this thin. The attempted comb-over doesn’t work and doesn’t do anything for him in my view. » Wow - amazing how opinions can differ !?!?!? » doesn’t work and doesn’t do anything for him in my view. The major flaw is the hairline, it is way too straight. » » » to it. I think the results for just BHT alone seem to be very good. » » » more density. » » Wow - amazing how opinions can differ !?!?!? » » doesn’t work and doesn’t do anything for him in my view. » The major flaw is the hairline, it is way too straight. He should have done the dusting effect or the ‘stubble’ look rather than attempting to build a straight hairline. My point is that considering he needed his entire head covered, and he used ONLY BHT, with 8,000 grafts I don’t know how much more he could have expected. Especially not using the best BH, beard hair. » » » » to it. I think the results for just BHT alone seem to be very good. » » » » more density. » » » Wow - amazing how opinions can differ !?!?!? » » » doesn’t work and doesn’t do anything for him in my view. » » The major flaw is the hairline, it is way too straight. » attempting to build a straight hairline. I think he went with the straight look to go with his creole haeritage. I think his results are pretty good. Way better than being bald. I think it would look alot better if he buzz cut it though. » expected. Especially not using the best BH, beard hair. i thought he had an HT in addition to bht? Good honest photos, where did the bulk of the body hair come from? Mostly chest hair? I think the result is very good. I often question the angulation graft placement from Dr. As clinic but the choice at the hairline is limited at this density. It seems to me that the temple points have been bought forward to an unatural / implausible degree ( shown in red) and the hairline could have been shaped a little more imaginatevly even considering his ethnic type. Still a great look. 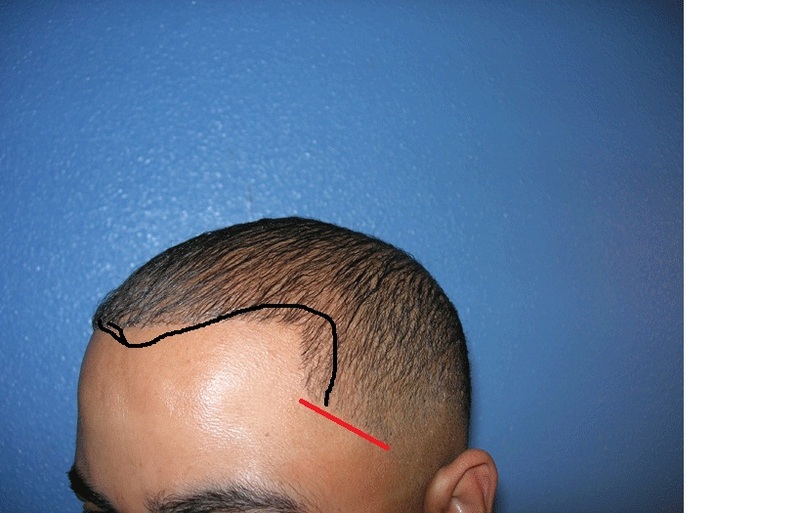 I agree, that for most patients, the hairline and temples marked by you on the picture will hold good. However, the hairline and temples created in magneto’s case was based on actual real life pictures in his ethnic group. A good reference hairline would be of the actor Will Smith.